The rock components of the crust are slowly but constantly being changed from one form to another and the processes involved are summarized in the rock cycle (Figure 3.2). 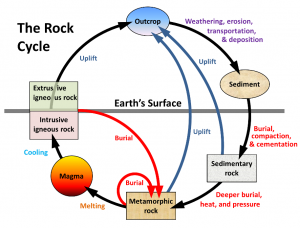 The rock cycle is driven by two forces: (1) Earth’s internal heat engine, which moves material around in the core and the mantle and leads to slow but significant changes within the crust, and (2) the hydrological cycle, which is the movement of water, ice, and air at the surface, and is powered by the sun. The rock cycle is still active on Earth because our core is hot enough to keep the mantle moving, our atmosphere is relatively thick, and we have liquid water. On some other planets or their satellites, such as the Moon, the rock cycle is virtually dead because the core is no longer hot enough to drive mantle convection and there is no atmosphere or liquid water. In describing the rock cycle, we can start anywhere we like, although it’s convenient to start with magma. 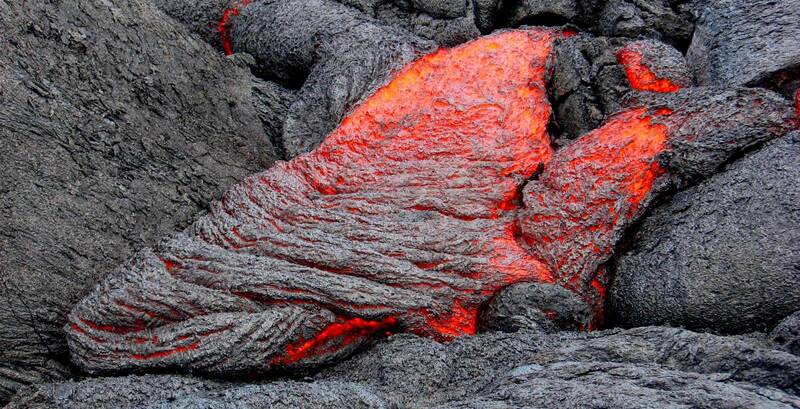 As we’ll see in more detail below, magma is rock that is hot to the point of being entirely molten. This happens at between about 800° and 1300°C, depending on the composition and the pressure, onto the surface and cool quickly (within seconds to years) — forming extrusive igneous rock (Figure 3.3). 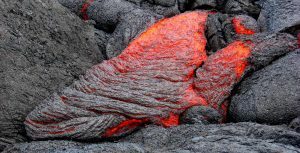 Magma can either cool slowly within the crust (over centuries to millions of years) — forming intrusive igneous rock, or erupt onto the surface and cool quickly (within seconds to years) — forming extrusive igneous rock. Intrusive igneous rock typically crystallizes at depths of hundreds of metres to tens of kilometres below the surface. To change its position in the rock cycle, intrusive igneous rock has to be uplifted and exposed by the erosion of the overlying rocks. Through the various plate-tectonics-related processes of mountain building, all types of rocks are uplifted and exposed at the surface. Once exposed, they are weathered, both physically (by mechanical breaking of the rock) and chemically (by weathering of the minerals), and the weathering products — mostly small rock and mineral fragments — are eroded, transported, and then deposited as sediments. Transportation and deposition occur through the action of glaciers, streams, waves, wind, and other agents, and sediments are deposited in rivers, lakes, deserts, and the ocean. 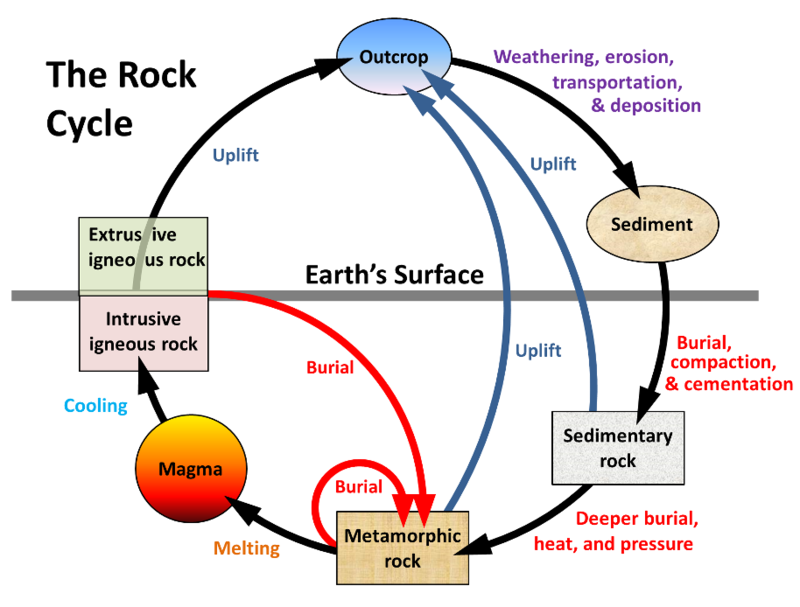 Referring to the rock cycle (Figure 3.2), list the steps that are necessary to cycle some geological material starting with a sedimentary rock, which then gets converted into a metamorphic rock, and eventually a new sedimentary rock. A conservative estimate is that each of these steps would take approximately 20 million years (some may be less, others would be more, and some could be much more). How long might it take for this entire process to be completed? Unless they are re-eroded and moved along, sediments will eventually be buried by more sediments. At depths of hundreds of metres or more, they become compressed and cemented into sedimentary rock. Again through various means, largely resulting from plate-tectonic forces, different kinds of rocks are either uplifted, to be re-eroded, or buried deeper within the crust where they are heated up, squeezed, and changed into metamorphic rock. 3.1 The Rock Cycle by Steven Earle is licensed under a Creative Commons Attribution 4.0 International License, except where otherwise noted.